We all like to think that with a good maintenance system and regular upkeep of our roof, we will never have to replace our roof. We like to believe that we are immune to the necessity of full out replacements as long as we make the necessary small repairs and do what we can to keep the roof in tip top shape. Unfortunately, this is not a reality unless you buy and move to a new home before that becomes your problem. 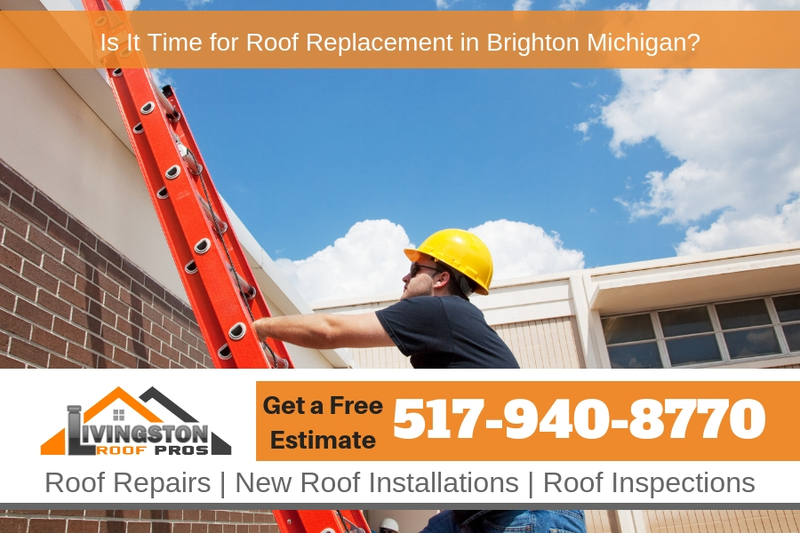 For any realistic circumstances, you will have to face roof replacement in Brighton Michigan at some point in your home ownership. Major issues with the roof, or simple age and wear, can all bring about the complete replacement of your roof. The roof is our most important portion of our home, so this isn’t an area we want to dwell on or neglect when it comes to care. At Livingston Roof Pros we can install a new roof on your home that can last for decades. There are many different choices you’ll need to make when getting a new roof installed in Brighton Michigan however which will have an impact on how long the roof will last. Higher quality materials will cost more but they will last a longer time. This is true for the roofing that is already on your home as well. If you have lower quality roofing chances are it will fail a lot faster than the higher quality counterparts. A roof inspection on your home can help to determine what shape your roof is in and if you need roof replacement in Brighton Michigan or not. Everything begins to wear out with age. Your roof is no exception. Considering that your roof is at the forefront of your home’s protection and defense, it has to withstand a lot of weather and climate conditions that will wear down the quality of it. If your roof is older than 20 years and you can begin to see discoloration or the wear and tear, it is time to replace it. If you can see cracks in your roof, you need to replace it as soon as possible. Neglecting to replace the areas with cracks, or the roof entirely, if it is bad enough, can end up causing you much more serious problems. Allowing the cracks to dwell can create a series of problems and can lead to damage on the interior of your home as well. Just as with damaged or cracked shingles or tiles, missing tiles or shingles can also result in serious long term damages and thus a more costly repair or replacement if not addressed immediately. Replacing missing tiles can save you in the long run, and also prevent you from facing some serious problems. Having shingles or tiles on hand to replace any that go missing could be beneficial, but remember that a professional can always get the job done efficiently and correctly, so be sure to weigh out your options before potentially causing more damage than repair. Additionally, a professional will be able to tell you if it is actually time to take on a full fledge roof replacement. If rainwater collects and sticks on the roof due to a weathered condition, you will begin to see moss and algae form. Moss and algae will spread all over your roof and can do quite a bit of damage. The algae will get deep in between tiles and can move into the interior of your home. Another sign that your current roof may be due to retire is the presence of natural light in your attic that isn’t coming from any venting or windows you have. Cracks that can’t be seen could allow light in and this will show through in your attic. An obvious sign of the same is any leaking in your attic or ceilings. These tell tale signs all could tell you that it’s time to call the experts and start the process of getting your roof replaced. If you suspect there is a problem with your roof in Brighton Michigan be sure to call Livingston Roof Pros today at 517-940-8770 for a roof inspection on your home. We’re fully licensed and qualified roofing contractor in Brighton Michigan ready to help!